The management of complex abdominal wall defects has challenged both general surgeons and reconstructive surgeons since the turn of the last century. 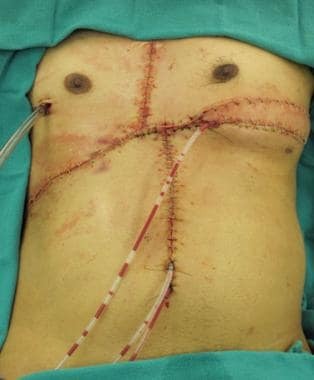 Formerly the domain of the general surgeon, the increasing complexity of the abdominal wall defects and the development of techniques involving manipulation and mobilization of muscle and myocutaneous flaps have drawn on the expertise of the plastic surgeon. Regardless of the surgeon’s background, the goals of the reconstructive surgeon in managing complex abdominal wall defects are to restore the structural and functional continuity of the musculofascial system and to provide stable and durable wound coverage. Prior to discussing an approach to repair, it is helpful to appreciate the magnitude of the problem posed by incisional hernias and other abdominal wall defects. From 2008-2009, approximately 381,000 cases of incisional hernia repair were reported, with an expected increase in case volume of 1-2% annually. This increase has been attributed to the growing age of the population, increasing rates of obesity and diabetes, improved survival from intra-abdominal cancers, and improvements in care of the critically injured patient, yielding greater survival of patients following abdominal catastrophe. These factors have produced a large subset of medically complicated patients with structurally complex abdominal wall defects. From a mechanical standpoint, greater understanding of the abdominal wall as a dynamic musculotendinous structure has led to characterization of a laparotomy incision within the linea alba as a tendon injury, akin to laceration of an upper extremity tendon. 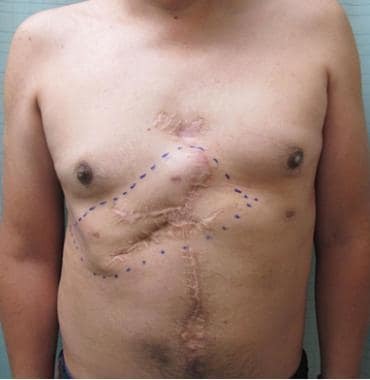 The laparotomy, as tenotomy, leads to myocyte replacement with fibrotic connective tissue and disordered arrangement of sarcomere structure, manifesting as a decrease in abdominal wall compliance that predisposes the abdominal wall to further injury. The concept of optimal tension has also been extrapolated from the hand surgery literature and applied to an understanding of hernia biology. The resulting shift from a “tension-free repair” to a repair under “physiologic tension” has led to changes in surgical technique, with a greater preference for lighter-weight prosthetic materials and more widespread use of components separation, a procedure designed to improve abdominal wall compliance. The abdominal wall serves to protect the abdominal organs, maintain upright posture and support the spine, and assist in bodily functions that require generation of Valsalva, such as coughing, urination, or defecation. There is also a suggestion that the absence of an intact abdominal wall results in loss of the mechanical endpoint of satiety, leading to unintentional weight gain. Indications for reconstruction can be both symptomatic and structural, with goals ranging from pain relief to prevention of incarceration. That said, while large abdominal wall defects can be plagued by significant herniation of intra-abdominal contents, the size of the fascial defect puts them at low risk for incarceration. Defects that ultimately require reconstruction may stem from trauma, tumor extirpation, previous abdominal procedures, and surgical management of severe infection. Treatment of malignant tumors of the abdominal wall requires aggressive resection of involved skin and subcutaneous tissue, as well as the myofascial component if it is violated by the tumor. Sarcomas are the most common and require both aggressive resection and radiotherapy. Intra-abdominal tumors can also involve the abdominal wall, either from contiguous or hematogenous spread. 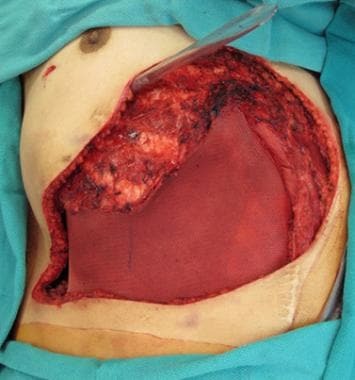 Reconstruction of the abdominal wall in these cases is usually directed by the extent of resection and the possibility of further surgical intervention (see case example images below). Forty-six-year-old patient with chest wall recurrence of primary visceral carcinoma requiring composite resection. 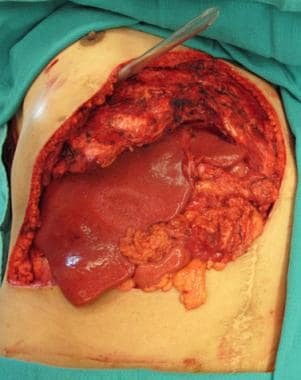 Resultant complex abdominal wall defect following resection. Note repair of the diaphragm to the revised costal margin and exposure of the liver. Coverage of the open abdominal defect with a Parietex composite mesh (Covidien; Norwalk, CT). Soft tissue closure of defect with right-sided pectoralis muscle flap, left myocutaneous latissimus flap, and "4-quadrant" fasciocutaneous advancement flaps. Abdominal wall defects associated with traumatic abdominal injuries are commonly a result of penetrating injury. These abdominal wounds may be grossly contaminated from simultaneous bowel injuries and require delayed reconstruction in multiple stages. Abdominal wall soft tissue infections are rare except as a complication of a prior mesh repair of abdominal fascia. However, cases of necrotizing fasciitis following inadvertent bowel injury during abdominal liposuction have been reported. Abdominal wall mesh infections commonly present as draining sinuses over the abdomen. Mesh infections are resistant to wound care and antibiotics. Often, successful treatment of the abdominal infection requires removal of the infected mesh and staged abdominal reconstruction. Regardless of the indication for repair, it is important to have clearly defined goals and objectives when proceeding with abdominal wall reconstruction. In some cases, the complexity or contaminated nature of the case may preclude definitive reconstruction in a single stage. In these situations, it may be prudent to cover or close the wound first, and defer management of the fascial defect until the patient’s status and operative conditions can be optimized. Attempts to treat both the wound and the fascial defect simultaneously may compromise the durability of the fascial repair or unnecessarily predispose the patient to complications such as infection or fistula formation. The anatomical layers of the abdominal wall include skin, subcutaneous tissue, superficial fascia, deep fascia, muscle, extraperitoneal fascia, and peritoneum. This anatomy may vary with respect to the different topographic regions of the abdomen. The major source of structural integrity and strength of the abdominal wall is provided by the musculofascial layer. The main paired abdominal muscles include the external oblique muscles, internal oblique muscles, transversus abdominis muscles, and rectus abdominis muscles and their respective aponeuroses, which are interdigitated with each other, and provide core strength and protection to the abdominal wall viscera. The integrity of the abdominal wall is essential not only to protect the visceral structures but also to stabilize the trunk and to aid trunk movement and posture. Early 19th century anatomist August Rauber described the large gap in the skeletal system between the lower edges of the thorax and the upper edge of the pelvis as the lacuna sceleti sternopubica. This gap is closed by the abdominal muscles and their aponeuroses. The skeletal system, which is relatively fixed, provides attachment points for the soft tissue and muscles of the abdominal wall. The skeletal anatomy of the abdomen consists of the xiphoid process, the costal cartilages of ribs 7-10, the floating ribs 11 and 12, the L1-L5 vertebrae, the iliac crests, the anterior superior iliac spine (ASIS), the pubic tubercle/pubic crest, and the pubic symphysis. The abdominal wall musculoaponeurotic structure is attached to the ribs superiorly, the bones of the pelvis inferiorly, and the vertebral column posteriorly. The superficial fascia of the abdominal wall is divided into a superficial and a deep layer. It may be as thin as half an inch or less or as thick as 6 inches or more. Above the umbilicus, the superficial fascia consists of a single layer. Below the umbilicus, the fascia divides into 2 layers: the Camper fascia (a superficial fatty layer) and the Scarpa fascia (a deep membranous layer). The superficial epigastric neurovascular bundle is located between these 2 layers. The abdominal subcutaneous fat, which is separated by the Scarpa fascia, is highly variable in thickness. The clinical relevance of this anatomy is appreciated when designing superficial inferior epigastric artery (SIEA) flaps. The SIEA flap has been used as a pedicled flap for hand reconstruction or as a free flap in breast reconstruction. The deep fascia is a thin, tough layer that surrounds and is adherent to the underlying abdominal muscles. Each abdominal muscle has an aponeurotic component that contributes to the deep fascia. The individual abdominal muscles are described below. The subserous fascia is also known as extraperitoneal fascia and serves to bind the peritoneum to the deep fascia of the abdominal wall or to the outer lining of the gastrointestinal tract. It may receive different names depending on its location (eg, transversalis fascia when it is deep to that muscle, psoas fascia when it is next to that muscle, iliac fascia). The peritoneum is a thin (one-cell thick) membrane that lines the abdominal cavity. It is useful in reconstructive efforts because it provides a layer between the bowel and mesh. In addition, studies have demonstrated the utility of the thin, pliable, peritoneal-lined rectus flap in vaginal wall reconstructions. The abdominal wall includes 5 paired muscles (3 flat muscles, 2 vertical muscles). The 3 flat muscles are the external oblique, internal oblique, and transversus abdominis. The 3-layered structure, combined with extensive aponeuroses, works in a synkinetic fashion not only to protect the abdominal viscera but also to increase abdominal pressure, which facilitates defecation, micturition, and parturition. The 2 vertical muscles are the rectus abdominis and pyramidalis. Fusion of the fascial layers of these muscles forms 3 distinct fascial lines: the linea alba and 2 semilunar lines. The linea alba is formed by the fusion of both rectus sheaths at the midline, while the semilunar lines are formed by the union of the external oblique, internal oblique, and transversus abdominis aponeuroses at the lateral borders of the rectus abdominis muscles. The external oblique muscle is the largest and thickest of the flat abdominal wall muscles. It originates from the lower 8 ribs, interlocks with slips of latissimus dorsi and serratus anterior, and courses inferior-medially, attaching via its aponeurosis centrally at the linea alba. Inferiorly, the external oblique aponeurosis folds back on itself and forms the inguinal ligament between the ASIS and the pubic tubercle. Medial to the pubic tubercle, the external oblique aponeurosis is attached to the pubic crest. Traveling superior to the medial part of the inguinal ligament, an opening in the aponeurosis forms the superficial inguinal ring. The innervation to the external oblique is derived from the lower 6 thoracic anterior primary rami and the first and second lumbar anterior primary rami. The internal oblique muscle originates from the anterior portion of the iliac crest, lateral half to two-thirds of the inguinal ligament, and posterior aponeurosis of the transversus abdominis muscle. The internal oblique fibers run superior-anteriorly at right angles to the external oblique and insert on the cartilages of the lower 4 ribs. The anterior fibers become aponeurotic at around the ninth costal cartilage. At the lateral border of the rectus abdominis muscle and above the arcuate line, the aponeurosis splits anteriorly and posteriorly to enclose the rectus muscle to help form the rectus sheaths. However, below the arcuate line, the internal oblique aponeurosis does not split, resulting in an absent posterior rectus sheath. The inferior aponeurotic fibers arch over the spermatic cord, pass through the inguinal canal and then descend posterior to the superficial ring to attach to the pubic crest. The most inferior medial tendinous fibers fuse with the aponeurotic fibers of the transversus abdominis muscle to form the conjoint tendon, which also inserts on the pubic crest. The transversus abdominis muscle is the innermost of the 3 flat abdominal muscles. The fibers of the transversus abdominis course predominantly in a horizontal orientation. It has 2 fleshy origins and 1 aponeurotic origin. The first fleshy origin is from the anterior three fourths of the iliac crest and lateral third of the inguinal ligament, while the second origin is from the inner surface of the lower 6 costal cartilages where they interdigitate with fibers of the diaphragm. Between the 2 fleshy origins is the aponeurotic origin from the transverse processes of the lumbar vertebrae. These fibers course medially to the lateral border of the rectus muscle. From about 6.6 cm inferior to the xiphoid process to the arcuate line, the insertion is aponeurotic and contributes to the formation of the posterior rectus sheath. The rectus abdominis muscles are paired, long, straplike muscles that are the principal vertical muscles of the anterior abdominal wall. The rectus abdominis is interrupted throughout its length by 3-4 tendinous inscriptions, all of which are adherent to the anterior rectus sheath and separated by the linea alba. These inscriptions can be visualized externally in a well-developed individual secondary to fasciocutaneous ligaments. The medial tendon of the rectus abdominis originates from the pubic symphysis and the lateral tendon of the rectus abdominis originates from the pubic crest. It inserts to the anterior surfaces of the fifth, sixth, and seventh costal cartilages and xiphoid process. The lateral border of each rectus muscle and its sheath merge with the aponeurosis of the external oblique to form the linea semilunaris. The rectus abdominis muscle functions as a tensor of the abdominal wall and flexor of the vertebrae. Additionally, this muscle helps to stabilize the pelvis during walking, protects the abdominal viscera, and aids in forced expiration. The rectus sheath is a strong, semifibrous compartment that houses the rectus muscles, the superior and inferior epigastric vessels, and the inferior 5 intercostal and subcostal nerves. It is formed by interlacing aponeurotic fibers from the 3 flat abdominal muscles. The anterior rectus sheath is the union of the external oblique aponeurosis and the anterior layer of the internal oblique. The posterior rectus sheath is composed of the posterior layer of the internal oblique aponeurosis, the transversus abdominis aponeurosis, and the transversalis fascia. Superior to the costal margin, the posterior rectus sheath is absent because the internal oblique muscle is attached to the costal margin and the transversus abdominis courses internal to the costal cartilages. The pyramidalis is a small triangular muscle located anterior to the inferior aspect of the rectus abdominis; the pyramidalis is absent in about 20% of the population. The pyramidalis originates from the body of the pubis directly inferior to the insertion of the rectus abdominis and inserts into the linea alba inferior to the umbilicus to assist in stabilization of the lower midline. Above the arcuate line, the anterior rectus fascia exists anterior to the rectus muscle, and the posterior rectus fascia is posterior to the rectus muscle. Below the arcuate line, the 3 aponeuroses merge together to form exclusively the anterior rectus sheath, with little or no posterior sheath. The arcuate line is generally located 2 fingerbreadths from the umbilicus to midway between the umbilicus and pubis. However, some reports in the literature state that the arcuate line is closer to 75% of the distance between the pubic crest and the umbilicus or 1.8 cm superior to the ASIS. The linea alba is the fusion of the anterior and posterior rectus fascia; it is located in the abdominal midline, between the rectus muscles, from the xiphoid to the pubis. The linea alba is a 3-dimensional composition of tendon fibers from abdominal wall muscles. Midline insertions of these fibers play a significant role in stabilizing the abdominal wall. The cranial aspect is attached to the xiphoid process, while, caudally, it inserts at the pubic symphysis. The linea semilunares can be seen as a pair of linear impressions in the skin that correspond with the most lateral edges of the rectus abdominis. These lines are visible in a person who is physically fit but obscured in a person who is obese. They are formed by the band of aponeuroses of the external oblique, the internal oblique, and the transversus abdominis muscles. El-Mrakby et al performed microdissections to analyze the vascular anatomy of the anterior abdominal wall. They concluded that the musculocutaneous perforators are the main providers of blood supply to the anterior abdominal wall. In addition, the vessels were further categorized into large (direct) or small (indirect) perforators. The indirect perforators generally have diameters less than 0.5 mm and terminate in the deep layer of the subcutaneous fat. Conversely, the direct perforators have diameters greater than 0.5 mm and course into the subdermal plexus to supply the superficial subcutaneous fat and skin. In addition, El-Mrakby et al described the area lateral and inferior to the umbilicus as the area with the richest concentration of perforator vessels. This vascular network allows multiple flap designs that may incorporate one or several perforator vessels. Zone I is defined by the mid abdomen and is supplied primarily by the deep epigastric arcade. As the internal thoracic artery passes behind the costal cartilages to enter the abdominal wall, it gives rise to the superior epigastric artery. This vessel then enters the abdomen and travels underneath the surface of the posterior rectus sheath. The superior epigastric artery joins the deep inferior epigastric artery through a series of choke vessels within the rectus above the umbilicus. Zone II is defined by the lower abdomen and is supplied by branches of the epigastric arcade and the external iliac artery. Blood supply superficial to the fascia is provided by the superficial epigastric and superficial pudendal arteries. Both of these arteries originate from the femoral artery. The deep iliac circumflex artery originates from the external iliac and runs deep to all abdominal muscles to provide blood supply to the area of the anterior iliac spine; it also pierces all 3 muscles of the lateral abdominal wall and provides a sizable musculocutaneous perforator. Zone III comprises the flanks and lateral abdomen. Blood supply to this area comes from the intercostal, subcostal, and lumbar arteries. The intercostal vessels leave the rib cage and enter the abdominal wall between the transversus abdominis and internal oblique muscles, where they anastomose with the lateral branches of the superior epigastric artery and deep inferior epigastric artery. Sensory innervation to the abdomen is derived from the roots of the nerves T7 to L4. These nerves travel in the plane between the internal oblique and transversus abdominis muscles. Motor innervation is provided by the intercostal, subcostal, iliohypogastric, and ilioinguinal nerves. These nerves must be preserved during abdominal wall reconstruction in order to maintain abdominal wall sensation and muscular function. See Regions and Planes of the Abdomen for more information. True contraindications to hernia repair are rare. A subset of minimally symptomatic or asymptomatic patients with very large hernias at very low risk for incarceration may benefit from observation rather than attempted repair. Additionally, in some patients, the cardiopulmonary stress or bleeding risk associated with major surgery may preclude operative management of their abdominal wall defect. Given the risk factors associated with the development of a ventral hernia, many of the potential candidates for repair have significant medical comorbidities. It is incumbent on the reconstructive surgeon to maintain an awareness of these comorbid conditions, as well as the alterations in physiology caused by the hernia defect or its repair. Patients with conditions such as chronic obstructive pulmonary disease (COPD), heart disease, or liver failure must be preoperatively screened. Postoperatively, patients with COPD may be difficult or impossible to wean from the ventilator. Intra-abdominal operations involve large fluid shifts and may cause significant cardiovascular stress intraoperatively and postoperatively, with intravascular return of third space volume in the early postoperative period. In addition, patients with liver failure have high morbidity and mortality rates with operations that require general anesthesia and should not undergo elective abdominal wall reconstruction. The risk of such a major operation for patients with the above comorbid conditions must be defined, as these risks may outweigh the benefit of abdominal wall reconstruction. Relative contraindications to elective abdominal wall reconstruction/ventral hernia repair include preexisting conditions that may increase the risk of recurrence (ie, smoking, mild COPD, obesity, diabetes, ascites, cancer, multiple hernia recurrences, a noncompliant patient). For more information on these conditions, visit the following Medscape Resource Centers: Smoking, COPD, and Diabetes. Ferzoco S. Abdominal Wall Defects: The Magnitude of the Problem. Presentation to the Abdominal Wall Reconstruction 2011 Consortium. Washington DC; June, 2011. Franz MG. The biology of hernia formation. Surg Clin North Am. 2008 Feb. 88(1):1-15, vii. [Medline]. [Full Text]. Carlson G, Bostwick. Abdominal wall reconstruction. Achauer BM, Eriksson E, Guturon B, Coleman J, Russell R, Vander Kolk, CA, eds. Plastic Surgery: Indications, Operations, and Outcomes. St Louis, Mo: Mosby; 2000. 563-74. Franz MG. The Biological Principles of Hernia Formation. Presentation to the Abdominal Wall Reconstruction 2011 Meeting. Washington DC; June, 2011. Berri RN, Baumann DP, Madewell JE, Lazar A, Pollock RE. Desmoid tumor: current multidisciplinary approaches. Ann Plast Surg. 2011 Nov. 67(5):551-64. [Medline]. Wilhelmi BJ, Blackwell SJ, Phillips LG. Langer's lines: to use or not to use. Plast Reconstr Surg. 1999 Jul. 104(1):208-14. [Medline]. Kraissl CJ. The selection of appropriate lines for elective surgical incisions. Plast Reconstr Surg. 1951. 8:1. Conway H. Notes on cutaneous healing in wounds. Surg Gynecol Obstet. 1938. 676:140. Nahai F, Brown RG, Vasconez LO. Blood supply to the abdominal wall as related to planning abdominal incisions. Am Surg. 1976 Sep. 42(9):691-5. [Medline]. El-Mrakby HH, Milner RH. The vascular anatomy of the lower anterior abdominal wall: a microdissection study on the deep inferior epigastric vessels and the perforator branches. Plast Reconstr Surg. 2002 Feb. 109(2):539-43; discussion 544-7. [Medline]. Taylor GI. The angiosomes of the body and their supply to perforator flaps. Clin Plast Surg. 2003 Jul. 30(3):331-42, v. [Medline]. Huger WE Jr. The anatomic rationale for abdominal lipectomy. Am Surg. 1979 Sep. 45(9):612-7. [Medline]. [Guideline] Geerts WH, Bergqvist D, Pineo GF, et al. Prevention of venous thromboembolism: American College of Chest Physicians Evidence-Based Clinical Practice Guidelines (8th Edition). Chest. 2008 Jun. 133(6 Suppl):381S-453S. [Medline]. Breuing K, Butler CE, Ferzoco S, et al. Incisional ventral hernias: review of the literature and recommendations regarding the grading and technique of repair. Surgery. 2010 Sep. 148(3):544-58. [Medline]. Sukkar SM, Dumanian GA, Szczerba SM, Tellez MG. Challenging abdominal wall defects. Am J Surg. 2001 Feb. 181(2):115-21. [Medline]. Pierce RA, Spitler JA, Frisella MM, Matthews BD, Brunt LM. Pooled data analysis of laparoscopic vs. open ventral hernia repair: 14 years of patient data accrual. Surg Endosc. 2007 Mar. 21(3):378-86. [Medline]. Vorst AL, Kaoutzanis C, Carbonell AM, Franz MG. Evolution and advances in laparoscopic ventral and incisional hernia repair. World J Gastrointest Surg. 2015 Nov 27. 7 (11):293-305. [Medline]. [Full Text]. Hamilton JE. The repair of large or difficult hernias with mattressed onlay grafts of fascia lata: a 21-year experience. Ann Surg. 1968 Jan. 167(1):85-90. [Medline]. Crawford JS. Nature of fascia lata and its fate after implantation. Am J Ophthalmol. 1969 Jun. 67(6):900-7. [Medline]. Matloub HS, Jensen P, Grunert BK, Sanger JR, Yousif NJ. Characteristics of prosthetic mesh and autogenous fascia in abdominal wall reconstruction after prolonged implantation. Ann Plast Surg. 1992 Dec. 29(6):508-11. [Medline]. Luijendijk RW, Hop WC, van den Tol MP, et al. A comparison of suture repair with mesh repair for incisional hernia. N Engl J Med. 2000 Aug 10. 343(6):392-8. [Medline]. Bender JS. Open retrofascial incisional hernia repair is a safe and effective operation. Am J Surg. 2016 Mar. 211 (3):589-92. [Medline]. Stone HH, Fabian TC, Turkleson ML, Jurkiewicz MJ. Management of acute full-thickness losses of the abdominal wall. Ann Surg. 1981 May. 193(5):612-8. [Medline]. [Full Text]. Voyles CR, Richardson JD, Bland KI, Tobin GR, Flint LM, Polk HC Jr. Emergency abdominal wall reconstruction with polypropylene mesh: short-term benefits versus long-term complications. Ann Surg. 1981 Aug. 194(2):219-23. [Medline]. [Full Text]. Dumanian GA. Discussion: Adipose tissue-derived stem cells enhance bioprosthetic mesh repair of ventral hernias. Plast Reconstr Surg. 2010 Sep. 126(3):855-7. [Medline]. Vrijland WW, Jeekel J, Steyerberg EW, Den Hoed PT, Bonjer HJ. Intraperitoneal polypropylene mesh repair of incisional hernia is not associated with enterocutaneous fistula. Br J Surg. 2000 Mar. 87(3):348-52. [Medline]. Engelsman AF, van der Mei HC, Busscher HJ, Ploeg RJ. Morphological aspects of surgical meshes as a risk factor for bacterial colonization. Br J Surg. 2008 Aug. 95(8):1051-9. [Medline]. Voskerician G, Gingras PH, Anderson JM. Macroporous condensed poly(tetrafluoroethylene). I. In vivo inflammatory response and healing characteristics. J Biomed Mater Res A. 2006 Feb. 76(2):234-42. [Medline]. Voskerician G, Rodriguez A, Gingras PH. Macroporous condensed poly(tetra fluoro-ethylene). II. In vivo effect on adhesion formation and tissue integration. J Biomed Mater Res A. 2007 Aug. 82(2):426-35. [Medline]. Candage R, Jones K, Luchette FA, Sinacore JM, Vandevender D, Reed RL 2nd. Use of human acellular dermal matrix for hernia repair: friend or foe?. Surgery. 2008 Oct. 144(4):703-9; discussion 709-11. [Medline]. Ramirez OM, Ruas E, Dellon AL. "Components separation" method for closure of abdominal-wall defects: an anatomic and clinical study. Plast Reconstr Surg. 1990 Sep. 86(3):519-26. [Medline]. Hadad I, Small W, Dumanian GA. Repair of massive ventral hernias with the separation of parts technique: reversal of the 'lost domain'. Am Surg. 2009 Apr. 75(4):301-6. [Medline]. Nguyen V, Shestak KC. Separation of anatomic components method of abdominal wall reconstruction--clinical outcome analysis and an update of surgical modifications using the technique. Clin Plast Surg. 2006 Apr. 33(2):247-57. [Medline]. Saulis AS, Dumanian GA. Periumbilical rectus abdominis perforator preservation significantly reduces superficial wound complications in "separation of parts" hernia repairs. Plast Reconstr Surg. 2002 Jun. 109(7):2275-80; discussion 2281-2. [Medline]. Ko JH, Salvay DM, Paul BC, Wang EC, Dumanian GA. Soft polypropylene mesh, but not cadaveric dermis, significantly improves outcomes in midline hernia repairs using the components separation technique. Plast Reconstr Surg. 2009 Sep. 124(3):836-47. [Medline]. Criss CN, Petro CC, Krpata DM, et al. Functional abdominal wall reconstruction improves core physiology and quality-of-life. Surgery. 2014 Jul. 156(1):176-82. [Medline]. Byrd HS, Hobar PC. Abdominal wall expansion in congenital defects. Plast Reconstr Surg. 1989 Aug. 84(2):347-52. [Medline]. Bauer JJ, Salky BA, Gelernt IM, Kreel I. Repair of large abdominal wall defects with expanded polytetrafluoroethylene (PTFE). Ann Surg. 1987 Dec. 206(6):765-9. [Medline]. Okunski WJ, Sonntag BV, Murphy RX Jr. Staged reconstruction of abdominal wall defects after intra-abdominal catastrophes. Ann Plast Surg. 1996 May. 36(5):475-8. [Medline]. Wilhelmi BJ, Blackwell SJ, Mancoll JS, Phillips LG. Creep vs. stretch: a review of the viscoelastic properties of skin. Ann Plast Surg. 1998 Aug. 41(2):215-9. [Medline]. Hobar PC, Rohrich RJ, Byrd HS. Abdominal-wall reconstruction with expanded musculofascial tissue in a posttraumatic defect. Plast Reconstr Surg. 1994 Aug. 94(2):379-83. [Medline]. Huwitz DJ, Hollins RR. Reconstruction of the abdominal wall and groin. Cohen M, Goldwyn RM, eds. Mastery of Plast and Reconstruction Surgery. 1st ed. Boston: Little Brown; 1994. 1357. Nahai F, Hill L, Hester TR. Experiences with the tensor fascia lata flap. Plast Reconstr Surg. 1979 Jun. 63(6):788-99. [Medline]. Dibbell DG Jr, Mixter RC, Dibbell DG Sr. Abdominal wall reconstruction (the "mutton chop" flap). Plast Reconstr Surg. 1991 Jan. 87(1):60-5. [Medline]. DeFranzo AJ, Pitzer K, Molnar JA, et al. Vacuum-assisted closure for defects of the abdominal wall. Plast Reconstr Surg. 2008 Mar. 121(3):832-9. [Medline]. De Santis L, Frigo F, Bruttocao A, Terranova O. Pathophysiology of giant incisional hernias with loss of abdominal wall substance. Acta Biomed. 2003. 74 Suppl 2:34-7. [Medline]. Madl C, Druml W. Gastrointestinal disorders of the critically ill. Systemic consequences of ileus. Best Pract Res Clin Gastroenterol. 2003 Jun. 17(3):445-56. [Medline]. Buck DW 2nd, Steinberg JP, Fryer J, Dumanian GA. Operative management of massive hernias with associated distended bowel. Am J Surg. 2010 Aug. 200(2):258-64. [Medline]. Abdominal wall reconstruction with components separation. Procedure performed by Paul Starker, MD, ColumbiaDoctors, New York, NY. Video courtesy of ColumbiaDoctors (https://www.columbiadoctors.org/). This drawing illustrates the components separation technique. A longitudinal incision is made at the semilunar line, and the relative vascular plane is dissected between the external and internal oblique muscles. Incising the anterior rectus sheath allows for advancement of musculofascial components medially. Hernia grading system: assessment of risk for surgical site occurrences. Wound infection defined as being contained within the skin or subcutaneous tissue (superficial), or involving the muscle and/or fascia (deep). The authors and editors of Medscape Reference gratefully acknowledge the contributions of previous authors Michael Neumeister, MD, FRCSC, FACS; Arian Mowlavi, MD; Elvin G Zook, MD; Mimis Cohen, MD, FACS, FAAP; and Aisha D White, MD, to the development and writing of this article. Burn Management: Are You Making These Critical Mistakes?